Jamie Dimon is CEO of Jpmorgan Chase, the massive bank that settled a $13 billion mortgage fraud case with the DoJ in 2013 by committing more mortgage frauds to raise the cash; he has since taken the bank into some of the dirtiest business on Earth, from the loans that keep the Keystone XL pipeline viable to funding the private border prisons where Trump's Kids in Cages are being held, terrified and separated from their families. Dimon is an infamous money-over-people crook: when Elizabeth Warren caught his bank failing to comply with rules put in place after the 2008 crisis, he smirked at her and told her to "hit him" with fines because the bank could easily afford them, having after the massive profit-taking from their massive frauds. He's even floated the idea of a presidential run in 2020. Now, Dimon's smirk is turning to rage, as he finds himself dogged by protesters everywhere he goes: speeches, shareholder meetings, when he comes and goes from work. 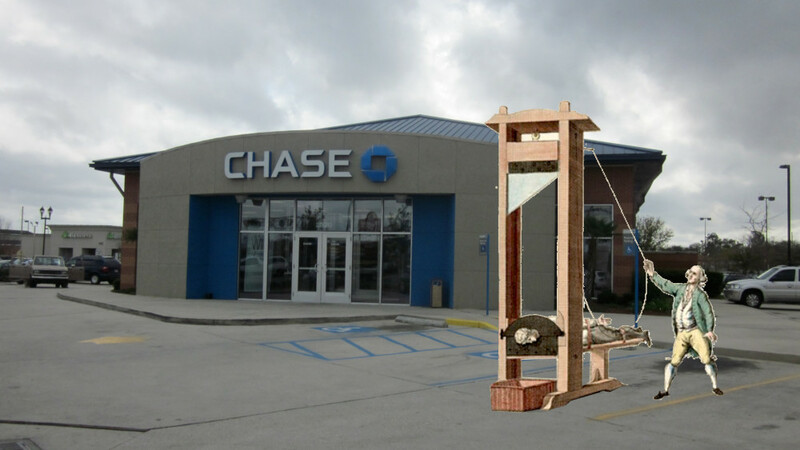 The activists call on him to divest from the bank's unethical business, which will not happen while Dimon is in command. But in the meantime, they are keeping these issues alive, afflicting the comfortable and ensuring that he does not have a moment's peace while he is profiting from others' misery and the destruction of the planet. Protesters have targeted Wall Street for years, but criticism at the annual conclave has shifted from the traditional corporate complaints about pay and risk-taking. The CEO is annoyed by the activism that now overshadows the event. “The shareholder meeting has become a farce,” Dimon told clients and employees in Washington in October. “I’m not against social groups,” he said, but the meetings “get hijacked.” A JPMorgan spokesman declined to comment. In September, Breech and climate activists disrupted Dimon’s talk at a hotel in Philadelphia with shouts about fossil fuels. JPMorgan lends to TransCanada Corp., whose controversial Keystone XL pipeline got approval from Trump to carry fuel from the Alberta tar sands to the Gulf. Before that, eight people were arrested when immigration activists blocked the streets outside his co-op on Manhattan’s Upper East Side. At one point, protesters at the gates to his building halted their chants, called for silence, and played the audio of Central American children sobbing in a detention center after being separated from their parents by U.S. authorities at the border. JPMorgan lends to GEO Group Inc. and CoreCivic Inc., which run facilities that hold immigrant families in Texas. Some protesters don’t just want Dimon’s help, they want atonement. At this May’s meeting outside Dallas, Juleon Robinson of the New Economy Project asked Dimon if Chase would provide reparations for giving less banking access and fewer loans to black and Latino customers in New York. “You seem like a bright young man who is highly misinformed,” Dimon said, before ticking through some of the bank’s philanthropic initiatives.